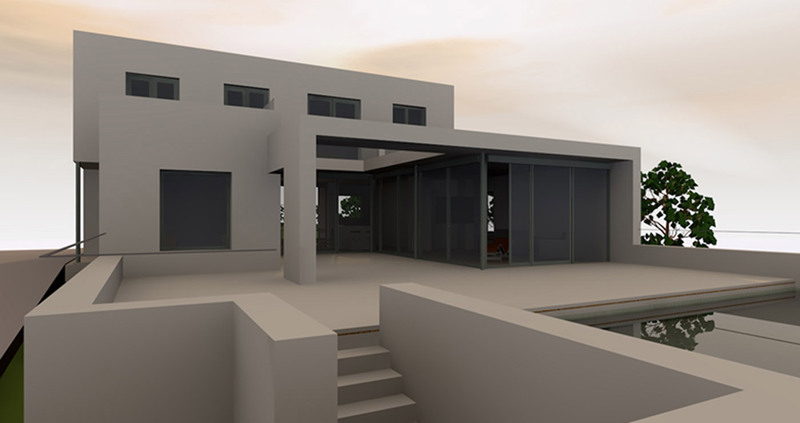 We have set up a Project for a couple of a singular dwelling at the city of Denia. The plot has excellent views towards the sea and the architect Scherpenbach introduces these views to the main living area of the dwelling. Through its hall, located at the southern façade, we get to the geometrical center of the dwelling. Even the center is a passway due to the fact that the staircase, which leads to the upper floor, has been placed there, the architect has generously dimensioned it in order to provide a dual functionality to this area, locating as well the living-room. 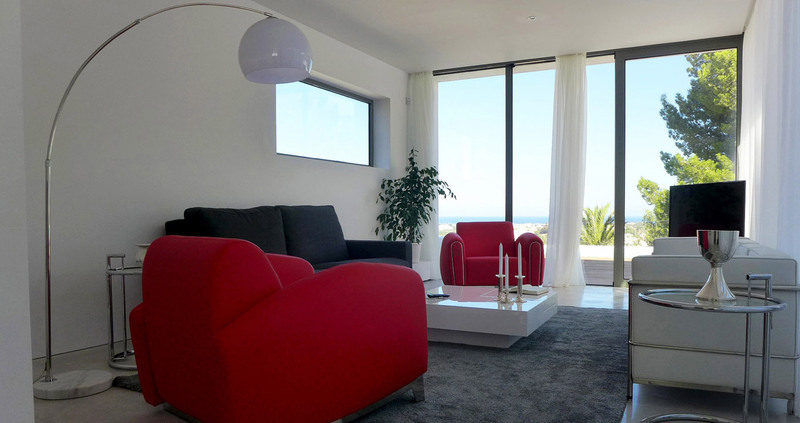 The closures of this area, at the eastern and western side are made of large windows which go from the floor to the ceiling and they are made of Cortizo lacquered aluminum profiles, with lift and slide doors along the whole perimeter free of walls. The kitchen is built in the dining-room and it is separated from the living-room by the fireplace. The whole basement has the same height as the swimming-pool and it can be accessed from any room. The interior can be distinguished from the exterior thanks to the materials. In the interior the floor has been made of a continuous polished concrete pavement which covers an underfloor heating. A treated cumarú wood flooring has been placed at the terrace. One of the main characters of the house is its staircase. 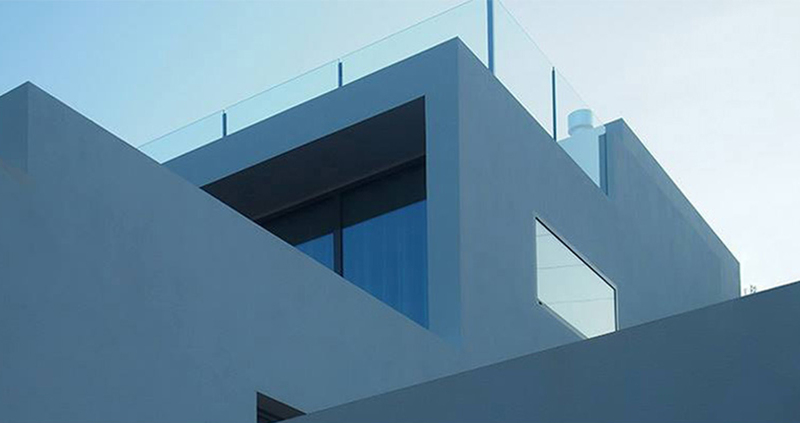 It has been built with cantilevered steps of reinforced concrete, and subsequently the exposed concrete has been polished. 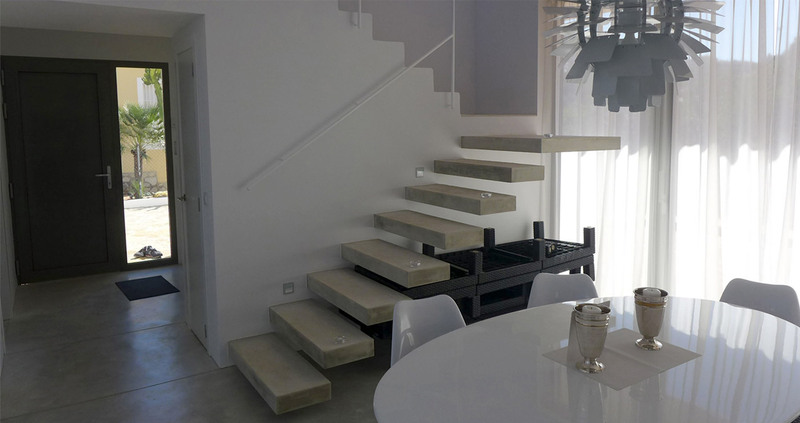 On the upper floor we can find the rest areas and wide terraces of polished concrete. The stairwell has been crowned with a skylight which creates an interesting play of light and shadows in the dining-room. 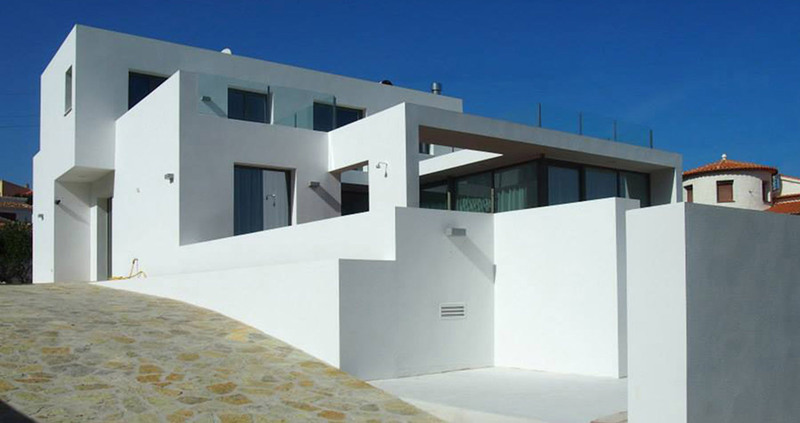 In referring to the structure the project of this house has been developed with a mixed structure made of load–bearing walls of thermal clay blocks and metallic abutments. The horizontal planes have been made with a unidirectional slab with pre-stressed joists and with concrete joists at the suspended floor. The intermediate slab has been made of two-way solid slabs of reinforced concrete, which provide extra light to the basement, achieving wide open spaces. Finally the roof structure has been made the same way as the suspended floor, which facilitates the implementation and reduces its costs. We have enjoyed building this house. The staircase was a major challenge but the architect was sure we would manage it successfully. And we did. If you want to see the construction process, click here.